The University of Colorado at Colorado Springs is using thin-film solar panels to provide energy to one of its largest and newest buildings. The UCCS Science and Engineering Building will use thin-film solar panels for energy. UCCS has installed the cutting-edge solar panels on the roof of its new 155,000-square-foot Science and Engineering Building at a cost of $107,000. Thin-film solar panels are a lighter and less costly alternative to the bulky silicon solar panels that have dominated the market for years. Last year, Time magazine included the panels in its list of the top inventions of the year. The campus is funding the project through a $25,000 grant from the Governor's Energy Office, a $39,000 rebate from Colorado Springs Utilities, and student-approved student fees. 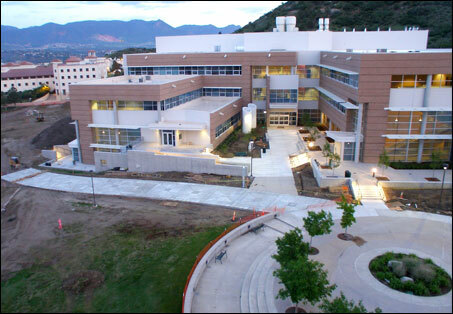 On Aug. 6, the campus will hold an opening ceremony for the Science and Engineering Building, now the most energy efficient structure at UCCS. Campus officials said the building would be the first in the state to feature the 13.6 kilowatt-hour solar panels. Electric utilities define the energy they deliver to customers in terms of kilowatt hours (kWh) used. The building will house science labs and classrooms for engineering, biology, chemistry and other student majors. Last year, the campus installed solar thermal panels on its new LEED gold-certified UCCS Recreation Center, and significantly reduced heating costs, campus officials said. The Leadership in Energy and Environmental Design (LEED) rating program is the U.S. Green Building Council's standard for green construction. The highest rating a building can obtain for its use of green technology and construction materials is gold. The CU system currently boasts several LEED gold- and silver-certified buildings on its three campuses. In the Science and Engineering Building's lobby, the campus community will be able to view a display of how much energy the panels are producing, as well as water and energy savings. Campus officials hope to obtain LEED certification for the new building as well.